The day began badly. I’d set the alarm for 2:30 a.m., hoping to set off on the bikes by 3:00. At 2:15 the phone rang—it was Eva Durance, one of my team members, calling in sick with a cold and fever. As I listened to her apologies, I heard another unwelcome sound—the dull roar of pouring rain. It had been raining when I went to bed, but I had hoped it would have let up by now. I crawled back into bed for a little more rest. Fifteen minutes later, Martin Gebauer, my other team-mate, and I were having breakfast, listening to the rain. At 3:00 I suggested we wait a bit longer, knowing that owling would be pointless in these conditions, but at 3:30 we made the decision to go anyways. We set off on the road to Max Lake, our headlamps illuminating the raindrops. We climbed up the big hill to the bottom of Husula Highlands and were greeted with our first bird—the song of an American Robin. As we reached Max Lake the rain seemed to be letting up a bit, a Common Poorwill sang loudly from the hillside, and three Soras answered my whistles from the marsh. Maybe the day wouldn’t be a total wash-out. By 4:00 we were up the valley in Flammulated Owl country. The poorwills were singing all over the place and the Townsend’s Solitaires were tuning up, but we couldn’t get an owl to respond to our hoots. We knew they were back—I’d heard one here on my first birdathon three days ago—but I guess the cold, wet conditions weren’t conducive to calling. As the sky brightened slowly, ever so slowly, I managed to call in a Northern Pygmy-Owl and the dawn songbird chorus began in earnest. Spotted Towhees, Dark-eyed Juncos, Black-headed Grosbeaks and Western Tanagers started to sing, one by one. We cycled back down the rough road and quickly found some good birds. A Veery called from the shrubbery—somewhat unexpected considering the late spring we were experiencing. A few metres down the road a Swainson’s Thrush called, the first I’d heard this year. And just beyond that, a Hermit Thrush! That species should be singing in the subalpine by now, but since the plateaus are still covered in deep snow I imagine it was extending its stay in the valley for a week or two. Back at the marsh, we finally got a Virginia Rail to answer my pathetic imitations, then three flycatchers in a row—Gray, Hammond’s and Dusky. As we cycled back through the rural suburbs of the West Bench we added new species thick and fast, and by the time we got back to the house at 6:00 a.m. we had 60 species in the bag. I mentioned to Martin that last year we had a Great Horned Owl family in the yard, but they hadn’t nested this year so they’d be harder to find. Martin replied, “You know, I dreamt I heard a Great Horned Owl hooting outside the bedroom window last night!” Since he had been sleeping right next to the spruce tree the owls traditionally perched in when calling, I suggested that maybe it hadn’t been a dream after all, but we were reluctant to put the species on the list on the basis of that. Ah well. We had just got in the house to grab our day supplies when the rain began again in earnest. We had a couple more pieces of toast and some coffee as it poured down, and I began reconsidering my tight schedule for the day. At 6:40 we decided we had to get going, and just then the rain subsided to almost nothing. At this fortunate sign, we headed downhill to the Okanagan River. A Lazuli Bunting flew by on the way down, but the chat wasn’t calling where we had it last year. Martin stopped to take a second look at a medium-sized bird atop a fir that I had written off as a robin, and shouted “Olive-sided Flycatcher!” Another bonus bird—maybe the late spring was going to help us after all, bringing a lot of the high-elevation species down to the valley bottom. A soggy Turkey Vulture moped on a nearby snag and three Great Blue Herons flew out of the new colony near the trail, followed by two Vaux’s Swifts; all nice birds to get. As we reached the Okanagan River channel a male Wood Duck rocketed upstream and a Downy Woodpecker landed in a cottonwood. Things were definitely looking up. Despite being behind in our schedule, I decided to make the quick trip up to Okanagan Lake, although it had been fairly empty for the past few days. Again we lucked out—a trio of teal, two Blue-wings and a Cinnamon—flew by, and offshore sat a Western Grebe, a Red-necked Grebe and two Common Loons. Doug Cooper, a birder from Vancouver, walked up, asking where the teal had gone. We told him they had disappeared to the east, but, noticing the nice scope he was carrying, offered to look for them. We were carrying a small scope because of weight and scope-safety concerns on the bikes, so this was a real bonus. We couldn’t find the teal, but did get three Bufflehead on the far side of the lake. 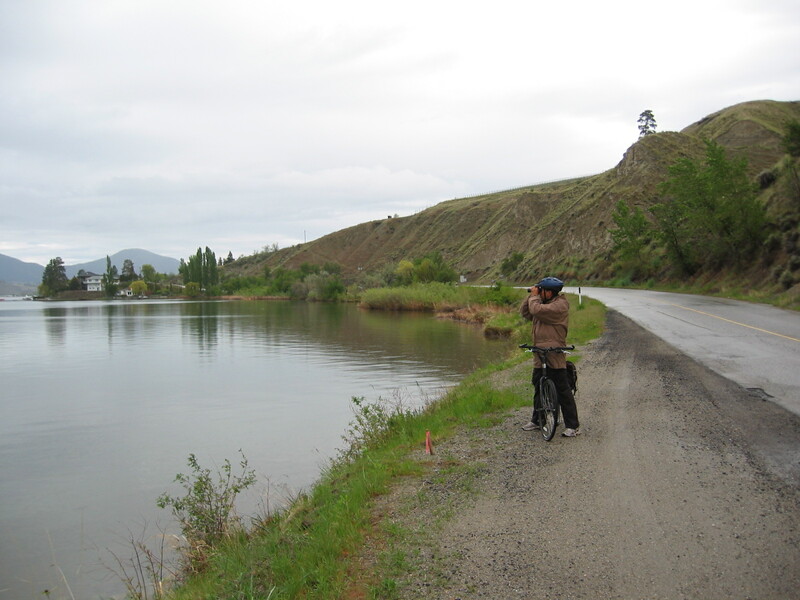 At 7:35 we turned south and cycled back down the river channel to Skaha Lake. The Yellow-breasted Chat was finally calling in the Ecommunity Place shrubbery; Martin expressed an interest in actually seeing the bird (he’d never seen one in Canada before), but I convinced him it would be easier (and quicker) to see one at River Road later in the day. At the muddy oxbow by the airport we added Ring-necked Duck, Barrow’s Goldeneye, Gadwall, and our first real rarity of the day—a single Cackling Goose. These small geese are rare at the best of times in the Okanagan, and are usually seen in winter or during the April spring migration. We got to Skaha Lake at 8:20—only 20 minutes behind schedule. Martin spotted some white objects on the beach and to our delight it turned out to be a flock of four tired American Avocets! Besides being gorgeous birds, avocets are very rarely seen in the south Okanagan. I phoned Laure Neish about the avocets–click here to see her pictures. And the lake itself—usually pretty barren by late May—had a nice array of ducks: Northern Shovelers, Lesser Scaup, Ruddy Ducks and single drake Northern Pintail. The latter species is very hard to find in the south Okanagan in May. Also at the river outlet was a Myrtle Warbler—perhaps a valuable addition if the Yellow-rumped Warbler is officially re-split back into Myrtle and Audubon’s later this year. As we did last year, we weaved through the runners competing in the Peach City Half-Marathon along the east side of the lake. Some of the leaders looked totally spent, and I must admit I wondered whether we’d look like that at the end of the day. When the second-place runner put on a spectacular display of projectile vomiting, though, I swore to ease off on the pace if we got near that state. The trip down the east side was otherwise uneventful, adding Rock Wren, Pygmy Nuthatch, Clark’s Nutcracker, and, just before the south end, a Herring Gull chasing a Bald Eagle. That would be our only gull of the day. All the birds at the north end of the lake had set us back in the schedule, so we had a quick break at the IGA in Okanagan Falls, then kept going south. I saw that the Meadowlark Festival geology tour my wife Margaret was on was still gathered in the Tickleberry’s parking lot, so nipped in there to pick up a pair of dry socks before continuing on to Vaseux Lake. We stopped in at the Vaseux Lake Bird Observatory site where we’d had a Long-eared Owl a few days before. We couldn’t find the owl, but did have one of the highlight experiences of the day. A Virginia Rail was walking through the shrubbery, giving agitated “keek!” calls. Thinking it was interesting to have a rail out of the marsh, I peeked in to get a look, then spied two tiny black fluffball young following it. The parent had found a nice worm for the young, so I backed out and let them finish their breakfast. At Vaseux Lake I vowed to get back on track with the schedule, so we didn’t cycle up the McIntyre/Irrigation Creek road as we had in the past. Luckily, a Canyon Wren sang loudly near the highway, and we scoped the Lewis’s Woodpeckers on the snag at the base of the cliffs. I figured the chances of seeing a Chukar were minimal, though I’d seen one the day before there, and we kept going down the highway, shaving an hour and a quarter off last year’s pace. We gazed up at McIntyre Bluff for a few minutes, hoping to catch a Peregrine Falcon sailing by, but had to content ourselves with a distant Golden Eagle. We got to Inkaneep Provincial Park by 12:30, but couldn’t find a MacGillivray’s Warbler—I assume those birds just weren’t back yet. Luckily, the local pair of Eurasian Collared-Doves were there. Then it was over the bridge and up River Road, where the male Black-chinned Hummingbird was waiting atop his bush. A Yellow-breasted Chat sang and Martin spotted it on a bush across the road. Phew! The marshes of Hack’s Pond didn’t have anything new, so we pushed on up Secrest Hill. Literally pushed—I have yet to make it up this wall of a hill without having to walk my bike. I told Martin it would be easier to hear the Lark Sparrows if we were walking, so was happy to hear that spectacular song as we reached the top. As he added the sparrow to the checklist, Martin asked when we were going to get Mountain Bluebird—I told him we’d have to wait until White Lake, as all the bluebirds in these ponderosa pine forests were Westerns. Just then a pair of Mountain Bluebirds flew in and proceeded to feed next to us! We stopped where the road crosses Park Rill to call for songbirds—we were still missing some easy ones like Cassin’s Vireo. A nice array of birds came into my pygmy-owl imitation: Red-naped Sapsucker, Townsend’s Warbler (another nice high-elevation species! ), Western Tanager, and Nashville Warbler, but no vireo. A few hundred metres up the road I whistled again, this time hoping for White-breasted Nuthatch, our big miss in the pine forests. No luck on that front, but a pygmy-owl flew in, followed by a flock of angry robins, crossbills and Cassin’s Finches. Around the corner we eventually did get the Cassin’s Vireo and headed north for White Lake. We reached the Willowbrook junction at 2:45 and I realized we had plenty of time to make a detour out to Green Lake. It would be a totally speculative 13-km round trip, as I hadn’t scouted that route at all lately, but it was good forest all the way, and who knew what would be on the small lakes. The first lake, Mahoney, immediately came through with three Green-winged Teal, so we were feeling good as we breezed down the hill to Green Lake. At first it looked empty of new birds, with only a few Barrow’s Goldeneyes, Buffleheads and Lesser Scaups, but we pushed on to the north end and were there surprised with a lovely Eared Grebe! We turned around and started back south to Willowbrook, when Martin commented that it would be nice if there were a short-cut to White Lake, which was over the mountains due west of us. I told him there was a track, though it was rather rough and involved a fair bit of climbing. We looked at each other, and decided on the spot to give it a try—at least it might produce a woodpecker or two. As we prepared for the climbing part of the trail by removing our long pants and long sleeves, a White-breasted Nuthatch obligingly flew in to be counted. That was species number 127 for the day, only three away from 130, a very respectable tally for an unassisted bike trip. The cycle up the trail through the rugged Kearns Creek valley was spectacular in the late afternoon sun. The rolling hills and meadows, the balsamroot in full glorious bloom turning the grasslands yellow. Up and up we went, then barrelled down through the pines to the willows along the creek and out to the sagebrush of the White Lake basin. No new birds and a lot of new sweat, but in many ways it was the best part of the day. At White Lake the Brewer’s Sparrows were in full song (128! 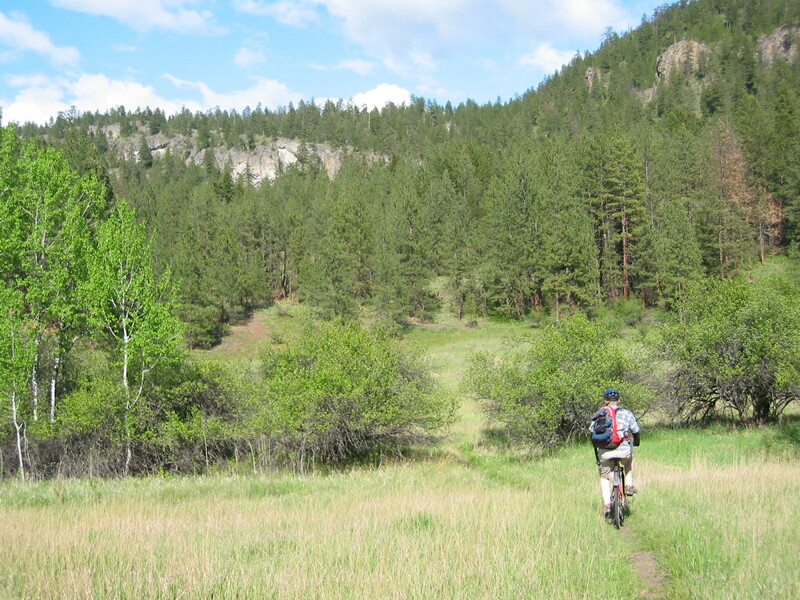 ), so we did the loop around the lake and ditched our bikes for a hike through the sage. Maybe we could find a singing Grasshopper Sparrow or kick up a Gray Partridge. We did find a Wilson’s Phalarope working along the lakeshore (129) but nothing else new. Still feeling good, we got back to the bikes and the day started to unravel a bit. Martin’s front tire was flat. He put a new tube in, but found that the valve stem didn’t match his (or my) pump, so could only partially inflate the tire. We gave up plans for a side trip to find the American Kestrels that nest up the Twin Lakes Road and instead limped along to Three Gates Farm, arriving on schedule at 7:00 p.m. There we had a Northern Saw-whet Owl nest lined up (130!) and, just as important, a great hostess in Doreen Olson, who plied us with several glasses of cold water to rehydrate our sweaty bodies. Just as we were thanking Doreen for the water, it began to pour again outside. This storm had come from nowhere and my thoughts of exploring the lush creekside habitat at Doreen’s, looking for Western Screech-Owl, MacGillivray’s Warbler, and any number of other species missing from our list, went by the board. We waited under cover until 8:00 p.m. then reluctantly said goodbye to Doreen and were off into the rain. Martin turned right at Kaleden to rejoin his family at Ponderosa Point and I continued on to Penticton alone. A car honked as I coasted down the long hill and I looked up to see my car go by with Michael Force waving out the passenger window. That would be my son Russell’s walking team heading home. I cycled back up the river channel as darkness fell, then turned up the KVR trail to the West Bench. As I pushed my bike up the last hill to home at 9:15 p.m., the rain stopped and a Great Horned Owl called—I guess Martin hadn’t been dreaming after all. Number 131 at kilometre 115. 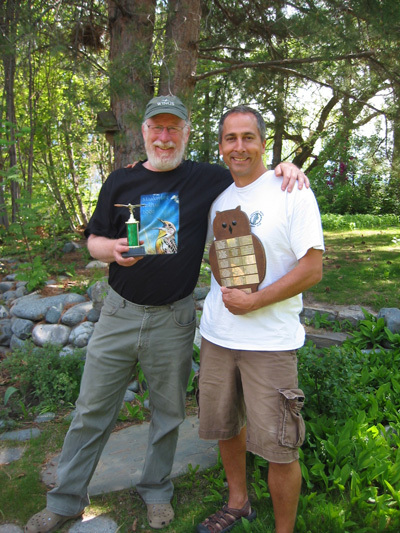 We won the coveted Flammulated Owl award for most species in the Okanagan Big Day Challenge! Note: I do this Birdathon as a fund-raiser for the Vaseux Lake Bird Observatory. You can make a pledge if you like by going to my Baillie Birdathon webpage and clicking on Sponsor Me. Thanks!